In 1995, mysterious top-secret black-and-white footage, supposedly filmed during the 1947 Roswell incident, was broadcast around the world. It showed the autopsy of an alien life form. The men responsible for the discovery of the footage, buddies Ray Santilli (Declan Donnelly) and Gary Shoefield (Ant McPartlin), claim it is a secret US government-shot film handed to them by “an inside party.” But the guys have an even bigger secret, and it’s not very pretty. 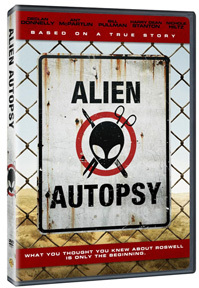 Based on true events, Alien Autopsy tells the bizarre and frequently quirky story of the two unlikely lads from London who became icons in UFOlogy with a discovery that stunned millions who’ve long searched for evidence of extraterrestrial life. Includes making of documentary, additional scenes, alternative ending and more. What you thought you knew about Roswell is only the beginning. Originally $16.95. Special sale price of only $12.95! ALIEN AUTOPSY: THE MOVIE Based On a True Story. 95 Minutes. DVD in Box. Special Features.